Flourless Almond Cake (Gluten Free Recipe) | Simple. Tasty. Good. There’s something about this golden flourless almond cake that makes it truly irresistible to me. This gluten free cake is fairly moist and flavorful but I guess it’s the grated coconut inside and the shaved almond bits on top that make this cake so delicious. How crunchy and moist it comes out of the oven! The cake texture is awesome. And that smell when it is baking… It will turn your kitchen right into a fragrant magnet for those hungry souls asking multiple times when the cake is going to be ready and if it really has to cool down or if they can slice in it right after the cake comes out of the hot oven and no they don’t mind a piping hot slice of this freshly baked almond cake. And indeed, in the end ‘they’ (read husband) were not capable of waiting until it had cooled down totally. I was lucky enough though to shoot a picture of the cake between the first slice and the second one. Anyway, this flourless almond cake is one of my best cake recipes I must say. 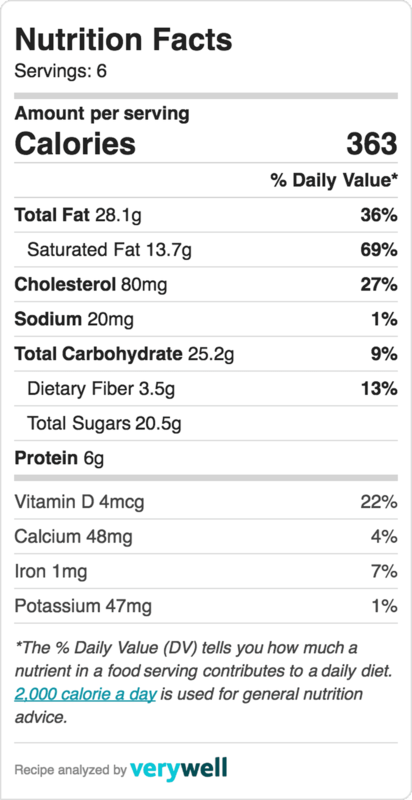 There I said it: flourless. Means that this almond cake is gluten free! No flour needed for this one. Looking for more gluten free desserts? Then take a look at my flourless chocolate cake, another popular cake here at home. I made this cake twice: once just using a mixing bowl and stirring the flourless almond batter manually. The second time I used my fabulous KitchenAid Stand Mixer Mini! Piece of cake, literally. If you are looking for that method, scroll down to the second recipe here on this page. Watch my video of how I’m preparing this flourless almond cake in my KitchenAid Stand Mixer Mini! I used a drop or two almond extract because it gives the cake an extra flavor kick but you can leave it out if you have none around. Or replace it by rose water or orange blossom extract. Tastes great too. Enjoy! Love this flourless almond cake? Then also check out my almond cake recipe with honey and yogurt! That one is not gluten free by the way, just to let you know. 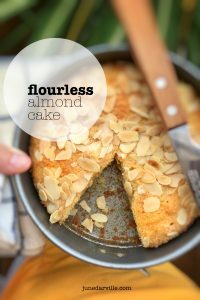 My flourless almond cake with crunchy shaved almonds! 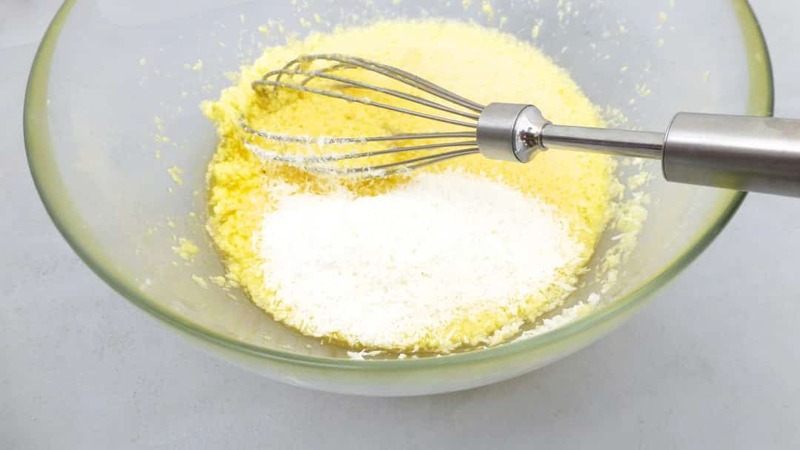 Add the soft butter, caster sugar and a pinch of salt to a large mixing bowl. Beat the ingredients for a minute until the soft butter and caster sugar are very creamy. Then add the whole eggs to the bowl. 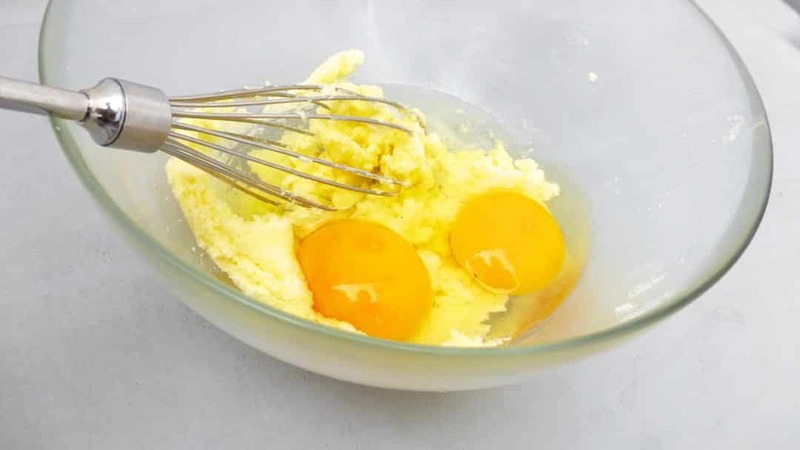 Whisk the eggs and butter well again until you get a smooth mixture. Try to avoid any lumps. Then pour in the grated coconut (keep a little handful aside to sprinkle over cake right in the end). Stir the batter well. Now add the ground almond flour or meal (keep a tablespoon aside to coat the cake tin with later on) and the drops of almond extract. Beat all the ingredients well now until you end up with a very smooth but rather thick batter. Make sure there are no butter lumps left. 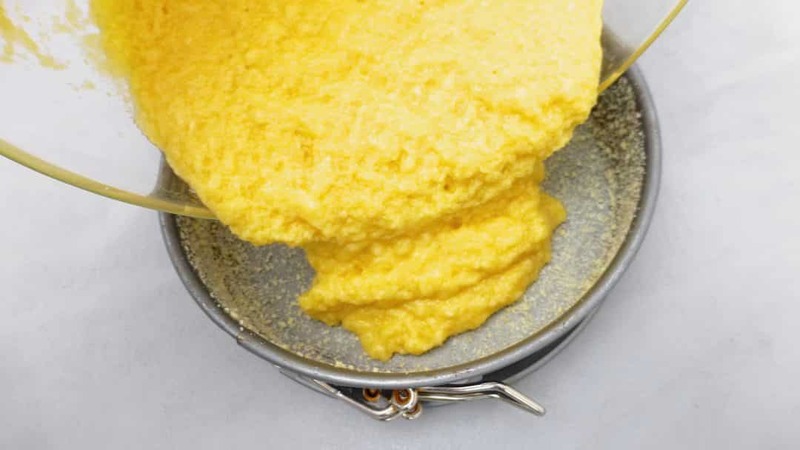 Lightly grease a springform tin with butter or vegetable oil and sprinkle with the rest of the almond flour or meal. Pour the almond batter in it and sprinkle with the shaved almond flakes and the rest of the grated coconut you kept aside. Bake the almond cake in a preheated oven at 356°F (180C) for 45 to 50 minutes. Then remove the cake from the hot oven and let it cool down fully at room temperature. Sprinkle the freshly baked cake with icing sugar, cut it and serve. Here’s the flourless almond cake that I prepared in my fabulous KitchenAid Stand Mixer Mini! Piece of cake, and you can take that pretty literally in this case. Lord, I can’t stop saying how great the KitchenAid Stand Mixer is to assemble batters, especially cake batters. 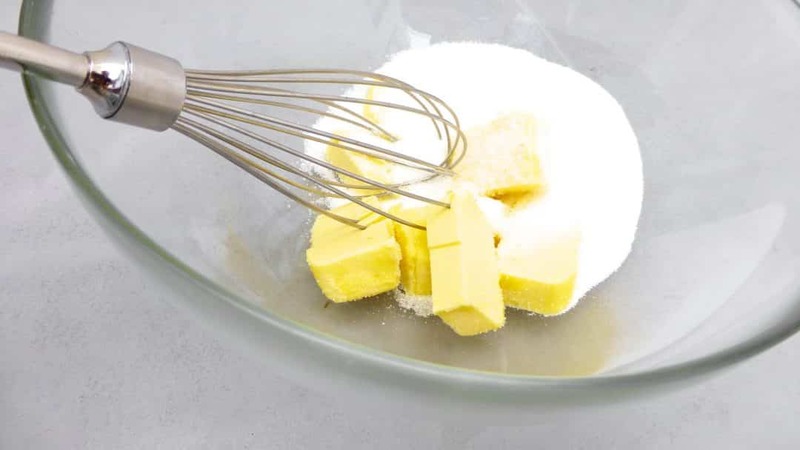 Just throw in all the ingredients, attach the flat beater and let the stand mixer work its magic! In the meantime you can preheat your oven and prepare that springform tin. And the best of all: there’s no sticky messy kitchen to clean up afterwards! Just put the dirty stand mixer bowl in the dishwasher and you’re done. My delicious flourless almond cake: moist and flavorful with crunchy shaved almonds! 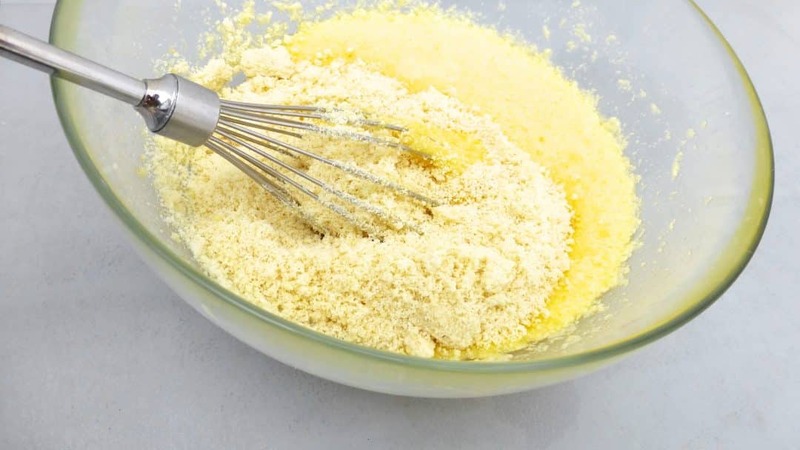 Add the almond flour or meal (keep a tablespoon of it aside to coat the cake tin later), sugar, grated coconut, soft butter, almond extract and the eggs to the bowl of the Stand Mixer Mini. Season with a little pinch of salt. Attach the flat beater and tilt the mixer head down. Set speed 4 and mix the batter for 5 minutes. In the meantime butter a small springform cake tin of 6 inches (15 cm) in diameter. Coat the tin with the almond flour you kept aside. Pour in the almond batter. Sprinkle with the shaved almonds. Bake the cake in a preheated at 356°F (180°C) for 45 to 50 minutes. Remove the cake from the hot oven and let it cool down fully at room temperature. Sprinkle the freshly baked cake with icing sugar, cut it and serve.